The film is said to be an adaptation of recent Bollywood hit ‘Special 26’ which starred Akshay Kumar in the lead role. Actor Suriya Sivakumar will next be seen playing a conman in a film titled ‘Thaana Serndha Kootam’ which is being directed by Vignesh Sivn. The film is said to be an adaptation of recent Bollywood hit ‘Special 26’ which starred Akshay Kumar in the lead role. ‘Thaana Serndha Kootam’ is slated to be released in January 2018 during Pongal and expectations on the film are pretty high. The film will also be released in Telugu as a dubbed version, the makers confirmed recently. It is being reported that the film has been titled ‘Gang’ in Telugu and will be jointly distributed with UV Creations. The Telugu version, ‘Gang’, will also be released along with the Tamil version on the same date, reports reveal. The makers are also releasing a teaser of ‘Thaana Serndha Kootam’ on November 30th, 2017 and currently it is the most awaited for film in Tamil circles. 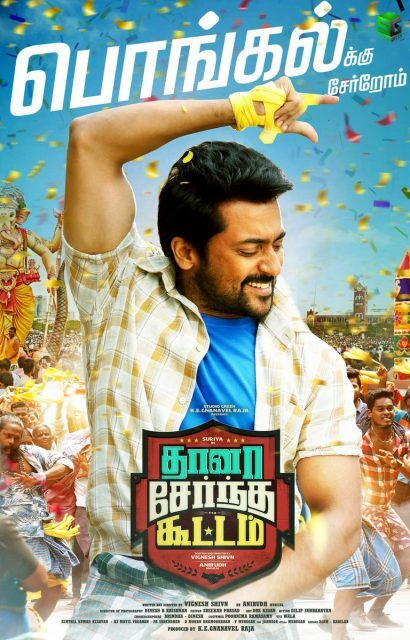 The first look posters ad the first single from the music album have created a huge excitement around the film and fans of Suriya are eagerly waiting for a glimpse of the actor from the film. The first single that was released recently, Sodakku, was a blockbuster hit and is being crooned by many across Tamil Nadu. The single which seems to be a celebaration of fans led by Suriya in the film and is a peppy mass number. The visuals indicate that Suriya could be playing a Kamal Haasan fan in the film, and given the kind of situation Kamal Haasan is in, that could be a possibility. Sung by Anthony Daasan, ‘Sodakku’ is another promising number from Anirudh and expectations will be quite high on this.